Greece is (undeniably) a brilliant choice of holiday destination. From the bustling historic hub of Athens to its sun-soaked islands complete with stunning scenery and soft white sands, it’s no wonder it draws holidaymakers back for repeat visits. However, sometimes it’s nice to break out of those holiday habits and shake up your summer with an exciting escape somewhere different. If you've already checked out this summer's top hotspots, then take a look at the holidays below that offer beaches and sunshine to rival those beautiful Greek isles. Equally, Turkey’s coast serves up miles of gleaming white sands, with the famous Blue Lagoon bay regularly topping the charts when it comes to the world's best beaches, not to mention the abundance of exciting excursions in top resort Olu Deniz. Or if you’re up for an exotic long-haul adventure, the white shores of Thailand’s coastline and idyllic islands will transport you to a tropical paradise. Want to know more about Turkey's hotspots? Check out our guide to Turkey's best coasts and resorts. Some Greek island resorts are notorious for their raucous nightlife, such as Malia in Crete, Laganas in Zante, Kavos in Corfu and Kardamena in Kos. If the up-all-night clubs and beach bars are what keep you going back to Greece, Ibiza, Majorca and Tenerife are waiting in the wings to take over as your go-to party destination. Browse our pocket guide to the Balearic Islands for a list of lively resorts, bars and beaches. Ibiza needs no introduction as the clubbing capital of the world. The biggest clubs, the best DJ’s, the coolest bars – it’s all happening on the White Isle, especially in San Antonio. Its fellow Balearic Island Majorca gives it a run for its money though, with Magaluf offering up a 24/7 party vibe thanks to the iconic BCM Square bringing open-air parties, cool club nights and endless bars to bounce between. From the Balearics we hop to the Canaries, where Tenerife waits with a neon-drenched nightscene in Playa de las Americas - Veronicas Strip, Starco and The Patch are the places to be in this lively resort. Greece is a destination with buckets of charm, from the lush hillsides stacked with whitewashed buildings, to the incredible views, traditional tavernas, endless olive groves and sunny lemon trees – it’s pretty, picturesque and definitely postcard worthy. For a different taste of La Dolce Vita, Italy is effortlessly charming. Fro the romantic city of Rome with its cobbled streets and world-famous landmarks, to beautiful Naples where an ancient city meets the dramatic Amalfi coastline - we've got your must-see guide to Italy covered. Holidays to Portugal are also sure to delight, with its majestic capital of Lisbon and the alluring Algarve coast, while a hop over to sunny Spain offers up traditional Catalan charm in Barcelona, the beach resorts of the Costa Brava, and beyond! 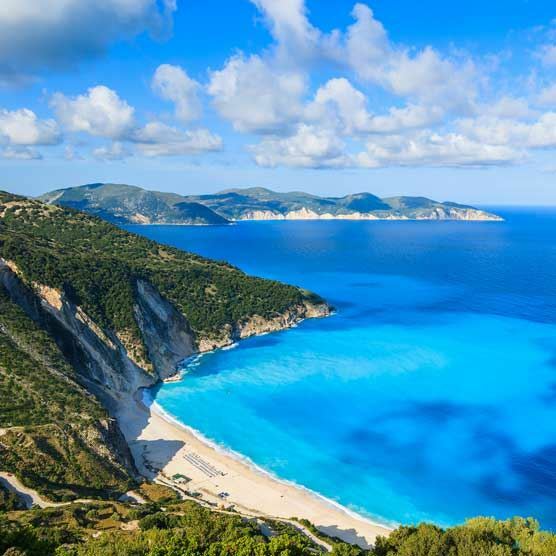 There are a whopping 40 Greek islands, including popular choices Crete, Rhodes, Corfu, Kos and Mykonos, and whichever is your favourite, you’re guaranteed beautiful beaches. Rocky coastlines make way for long and lively sandy stretches, hidden coves and secluded inlets, and better still, there’s a beach to suit everyone. If holidays to you are all about the beachlife, why not give Menorca a go? This quieter Balearic island has many stunning sandy spots, where fine sands are backed by rocky hills and thick pine forests, and relaxed, lazy days on the beach are a must. The best time to visit Menorca is in March, when temperatures are toasty enough for a tan but not too hot for a wander around the Mediterranean towns. Greece and its islands has an incredible backstory, with the entire destination being something of a giant archaeological site. From the Acropolis of Athens to Knossos Palace in Crete to the Palace of the Grand Master in Rhodes, there are endless ancient sites to discover here. Why not step back even further in time to ancient Egypt with a trip to the temples, pyramids and monuments of Luxor and Cairo? Or enjoy a quiet escape to Malta to see its stunning waterside capital Valetta - crowned as one of the most concentrated historic areas in the world - or the medieval Medina and Roman Rabat. If Mexico's rich Mayan history is more up your street, head to the main tourist spots of Cancun and Puerto del Carmen and visit the pyramids of Chichen Itza and the iguana-infested Mayan ruins of El Rey. Punctuated with towering mountains, craggy coastlines and lush forests teeming with thousands of species of floral and fauna – not to mention the vast, deep blue of the bordering Ionian, Aegean and Mediterranean Seas, Greece boasts an incredible landscape that leaves you wanting more. If you're seeking spectacular scenery, why not let Lanzarote’s lunar-esque volcanic landscape transport you to another world? Or experience the contrast between the snow-capped peaks of the Atlas mountains and the sun-kissed sands of the Sahara in Morocco? Cyprus is another breathtaking beauty, with its rolling hills and mountains covered in thick forest, and a dramatic coast lined with steep cliffs, sandy bays and rocky waters.